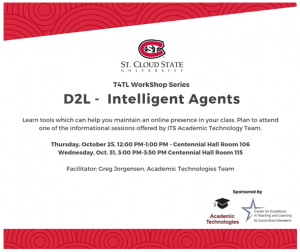 T4TL Workshop: D2L Intelligent Agents | A . T . T . N ! Intelligent Agents provide automated communication techniques to help you maintain an online presence and increase student engagement. Learn more about how to create intelligent agents by attending the upcoming session offered by ITS Academic Technology Team on Wednesday, Oct. 31, 3:00 PM -3:50 PM in Centennial Hall 115. If you can’t join us in person, you can participate online using Adobe Connect: https://webmeeting.minnstate.edu/t4tlworkshops.